When I moved to Utah in the early ’90s, eating at local ski areas was, for the most part, merely a matter of necessity. One needs fuel for skiing and boarding the incredible terrain here. But it wasn’t something I usually relished, given that the options at most ski areas and resorts boiled down to warmed-up chili con carne from cans; frozen burger patties that tasted like the box they came in; sad, dried-out hot dogs; wilted iceberg lettuce salads; and microwave pizzas. Thankfully, that has all changed. Canyons, Snowbird, Solitude and Deer Valley Resorts, in particular, keep raising the culinary bar; even the most discriminating food enthusiast can find interesting, wholesome and delicious dining at higher altitudes. The following are some of my tastiest food discoveries from the slopes this season. Following my arrival in Utah, it didn’t take me long to fall in love with Alta Ski Area (210 Little Cottonwood Canyon Road, 801-359-1078, Alta.com). Back then, Alta’s Albion Grill was my default lunch spot, and to this day I still love the chili con carne—this one made from scratch and brimming with perfectly spiced ripe red tomatoes, beans and beef. For 21 years, owner/operator Tim Evenden has been at the Albion Grill helm and, along with the chili, Evenden’s unique granola recipe has garnered a bevy of fanatic followers. 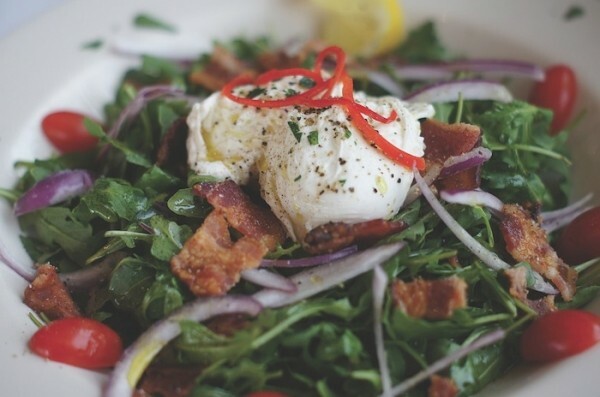 With that in mind, we sipped our La Vieille Ferme Blanc a little slower than usual, while enjoying an excellent organic arugula salad with crispy bacon, red onion slices, grape tomatoes and extra-virgin olive oil, plus two perfectly poached eggs on top. Even better was a fillet of Duarte lock salmon, kissed with a snappy Jamaican jerk-style blend of spices, sauteed and served with rice pilaf and a melange of fresh veggies. The grand finale at Collins Grill was a gorgeous blueberry panna cotta served with whipped cream and a sugar sprinkle. Alta’s Collins Grill is hitting high notes at high altitude. If there’s an old-school-style pub and eatery left at Utah’s ski and snowboard areas, it has to be Molly Green’s Restaurant & Bar, located at Brighton Resort (8302 S. Brighton Loop Road, 801-532-4731, BrightonResort.com). The slopeside A-frame chalet, with its roaring fireplace and friendly vibe, is a throwback to a day when “ski bum” was still a respectable life choice. It’s the perfect aprÃ¨s ski spot, and there’s never a shortage of reggae tunes to groove to. What surprised me most about Molly Green’s was the food and service. The servers could not be nicer or more efficient—especially during busy lunches when the restaurant and bar sometimes fills to standing-room only. Molly’s has come a long way since the days when it was a private, adults-only club. I’m pretty picky about pizza, and so I sure was pleasantly surprised by the top-notch, hand-tossed fresh pizzas made at Molly Green’s, which are available with a herb, traditional or thin crust. These bad boys—about the circumference of a snow tire—aren’t for wusses; they’ll feed a famished crowd. The missus and I ordered the Doyle’s Dive—pepperoni, Italian sausage, ground beef and ham—and wound up eating leftovers for days after. Other highlights included Milly’s chili, a rich bowl of superior housemade chili con carne; the “Hotter Than Hot” spicy baked chicken wings; a very respectable Philly cheese-steak; and the killer garlic burger. Deer Valley Resort (2250 Deer Valley Drive, 435-649-1000, DeerValley.com) has long been known for its high-end dining, and has garnered many, many awards for its food, service and amenities. I’ve written about the dining scene at Deer Valley in the past. There was nothing high-end, however, about my most recent Deer Valley dining discovery. I was skiing at the resort and stopped into Empire Canyon Lodge for lunch. As I often do, I enjoyed the excellent grilled-cheese sandwich made with Swiss and cheddar on toasted sourdough bread. While awaiting my sammich, I eyeballed some very tasty-looking potato chips. They turned out to be the best potato chips I’ve ever eaten, bar none. They are housemade, thin-sliced, freshly fried in canola oil and sprinkled just a hint of salt; beautifully crispy and crunchy and tasting like actual potatoes. Who knew that Deer Valley served up such spectacular spuds? My final stop was at Needles Lodge at Snowbasin Resort (3925 Snowbasin Road, Huntsville, 801-620-1000, Snowbasin.com). The lodge is located at 8,710 feet with the stunning, panoramic views you’d expect at such an altitude. Needles offers daily specials like meatloaf on Mondays, street tacos on Tuesdays, potpies on Thursdays and weekend enchiladas. But there are two menu items that meat lovers really need sink their teeth into. First, there’s a Niman Ranch Kobe beef hot dog, served on a fresh pretzel roll. I love pretty much any hot dog, but Kobe beef puts this terrific tubesteak into a class of its own. And then, for the skier or boarder with a gargantuan appetite, may I suggest the Needles Bomber burger? It’s a half-pound of grilled, all-natural, grass-fed Idaho beef, 6 ounces of grilled corned beef, Swiss cheese, pickles, Thousand Island dressing and sauerkraut on a toasted brioche. Help! Ski patrol!